This is about building a sailboat, in our backyard in Charlottesville, Virginia where I live and sell real estate for a living. 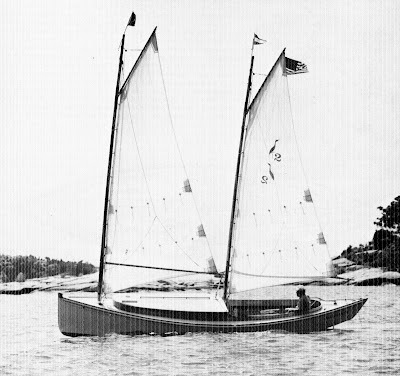 The Reuel Parker Egret 31.5 is a “Sharpie” which was a very popular style of shallow draft working or fishing sailboat in the latter half of the nineteenth century in the US. L. Francis Herreshoff explains: “It is quite befitting in these hard times that more should be written about the good little ships developed by Commodore R.M. Munroe of Coconut Grove, Florida. Certainly the boats designed by the Commodore are among the best examples of American shallow draft cruisers, and the reason for it is that he entirely disregarded the racing measurement rules which have influenced and spoiled most yachts. “I use the word “yachts” instead of “racers” because unfortunately during the last hundred years the sailing yacht in most cases has imitated the racing yacht. It seems that yacht designers as a class are prone to copy the extremes that have made other yachts notorious and, as draft for many years was not limited or penalized, yachts became deeper and deeper. Also during most of Commodore Munroe’s life waterline length was the principal factor in measurement, so that from 1890 to perhaps 1910 most all sailing yachts of any class were shorter on the waterline and deeper than was desirable for any reason except for racing. 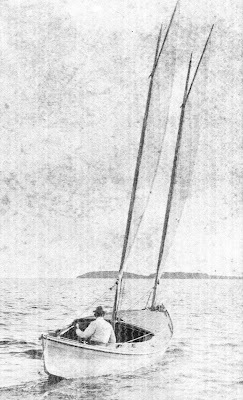 While it is true that others occasionally designed sailboats that were long and shallow, it is likely that no other man designed so many that were entirely free from the influence of measurement rules; so today, when most all existing yachts are spoiled in hull proportion by past measurement rules, and ruined in sail plan by the present ocean racing rules, it is refreshing to study the good little ships designed by Commodore Munroe. “There is no doubt that the boats, or little ships, developed by Commodore Munroe were strong, long-lasting and economical to build. They could be beached with little danger of injury and were the easiest in a sea way of any small craft ever built..
“At the present time (1952) the cost of most all yachts and boats is beyond the value they may repay in pleasure, so these shallow, inside-ballasted little ships of small sail area become at this time perhaps the only real sensible craft one can contemplate. Sharpies are a type of hard-chined sailboat with a flat bottom, extremely shallow draft, centreboards and straight, flaring sides. They are believed to have originated in the New Haven, Connecticut region of Long Island Sound, United States. They were traditional fishing boats used for oystering, and later appeared in other areas. With centerboards and shallow, balanced rudders they are well suited to sailing in shallow tidal waters. Sharpies first became popular in New Haven, Connecticut, towards the end of the 19th century. Although their origin is unknown, it has been said that they came into use as a successor to the dugout log canoe and derived from the flatiron skiff. These sharpies were typically used for oyster tonging and evolved to suit that work. They grew in popularity because they were easy to row, cheap to build and fast under sail. Varying in length, the 24–28 ft one-man boats usually had one sail, while the larger two-man boats which were around 35 ft were rigged with two sails, as cat-ketches. They had leg-o-mutton sails with sprit booms on unstayed masts. The larger boats had three mast-steps; one at the bow, one amidships and one in between. Typically, in the summer, two masts would be stepped: one at the bow and amidships. In the winter, when heavier winds were expected, a single mast would be stepped in between. Their hulls were narrow with a large sheer and low freeboard. At the ends you will find a plumb bow with the heel of the stem sitting just out of the water and a round stern. The centerboard was long and shallow as was the balanced rudder. The sharpie type migrated south and west to other regions where shallow water prevented deep-draft vessels from operating, including Chesapeake Bay, the Carolinas, the Great Lakes (Ohio) and Florida. Although most sharpies were rigged as a leg-o-mutton cat-ketch with free standing masts and sprit booms, larger versions – especially those found in the Carolinas and Florida – used stayed gaff schooner rigs which included a jib. Sharpies were introduced to Florida in 1881, when Commodore Ralph Munroe brought the 33-foot New Haven style sharpie, of his own design, “Kingfish” to the Miami area of Florida. Perhaps the most famous of sharpies was the Commodore’s “Egret” design, now immortalized in plans available from Wooden Boat magazine. 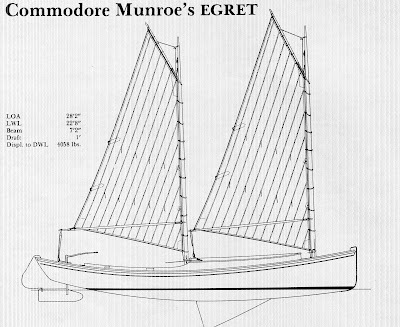 Commodore Monroe designed Egret in 1886 and had her built on Staten Island and delivered to Key West. Egret was unique in that she had higher, flaring sides than the typical sharpie and was double-ended. This meant more stability as she was loaded and the ability to run before a following sea without waves breaking over the stern. These attributes contributed to behavior that led the Commodore to call the Egret a “sharpie-lifeboat”. Profile of Egret drawn based on research by Jon Wilson (Woodenboat Magazine Founder), with input from Bob Baker, Maynard Bray, Dave Dillon, and Joel White. Image courtesy of Woodenboat Publications. Lines Drawing of Egret. LOA 28′ 2″ LWL 22′ 8″ Beam 7′ 2″ Draft 1′. Courtesy of Woodenboat Publications. Like many others, I have found myself under the spell of Egret’s superb lines, which could be described as a cross between a sharpie and a dory. Her swept-up stern and distribution of buoyancy put me strongly in mind of our Australian Surfboats, so the combination of the three hull forms gives her a wonderful pedigree. 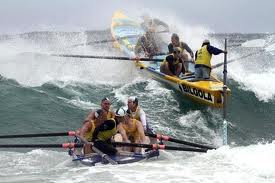 Australian Surfboats in action. They share full forward sections, substantial flare, and fine, raised stern sections with Egret. This is not surprising as both were designed or evolved to deal with the same conditions. Ross Lilistone mentions Reuel Parker, and it is he who designed the sharpie I am building in my back yard. Reuel has designed and built a number of boats over the years, and sailed them, so his boats tend to be on the practical and they are also beautiful. He has designs for boats from 17 – 70 feet on his Parker Marine website and he has built a few sharpies of various sizes, from 17 – 46 feet. Here are images of Reuel’s design for his Sharpie 31.5 which I am building. In Reuel Parker’s Design Commentary he writes the following: “Many naval architects in the past century have been fascinated by Commodore Ralph Munroe’s Egret design from the 1880’s. Both Howard I. Chapelle and Joel White designed versions from which numerous examples have been built. When I wrote The Sharpie Book I designed my own version and added it to the ranks. But clients over the years have asked for larger versions, which led me to design 33′, 36′ and 39.5′ models of this remarkable vessel. I even have a 45′ version in my notebooks, which will be a long-distance cruiser, with partial outside ballast like the 39.5. And in the interest of MAXI-TRAILERABLE boats (no slip/no boatyard), I designed a 38′ version in early 2007. She has a 10′ beam and 6′ 1″ standing headroom. In early 2011 I designed a 31′ 6″ Egret with trailerable beam of 8′ 6″. She has two layout options, four rig options, headroom of 5 feet, and draft of 14 inches. “In addition to having remarkable seaworthy properties, the Egret type allows more headroom than is available in any other sharpie of her size. Another application of the “what goes up, must come down” law of nature is that a boat that has a lot of hull and superstructure above the waterline must have matching keel area and ballast down below the water. This is true particularly for sailboats, so that they neither tip over nor blow sideways. To achieve standing headroom in a flat bottomed boat, either the hull and/ or cabin trunk must be quite high, or the hull bottom must be quite low, or both. The obvious solution to a high boat is to make it big, so that it is no longer proportionately high (usually over 50 feet for a sharpie). A less obvious solution is to make the flat bottom narrower than usual, and give it plenty of rocker (fore-and-aft curvature), pushing the middle portion considerably deeper in the water. As this transformation in hull shape takes place, the vessel becomes closer in form to the dory. “Certainly the combined features of sharpie and dory produce an excellent hull type, retaining qualities of speed, seaworthiness, light weight, dryness and reasonable stiffness after initial heeling. Because the bottom is deeper in the water, the flaring topsides can be higher, creating a dryer, more comfortable, more seaworthy hull that can include more headroom in a smaller size than any true sharpie hull can afford. Munroe later improved on his sharpie design with his Presto, a more round-bottomed sharpie, more suited to heavy seas, yet still a shallow draft centerboard design.